Lewis Carroll is a pen-name: Charles Lutwidge Dodgson was the author's real name and he was lecturer in Mathematics in Christ Church, Oxford. Dodgson began the story on 4 July 1862, when he took a journey in a rowing boat on the river Thames in Oxford together with the Reverend Robinson Duckworth, with Alice Liddell (ten years of age) the daughter of the Dean of Christ Church, and with her two sisters, Lorina (thirteen years of age), and Edith (eight years of age). As is clear from the poem at the beginning of the book, the three girls asked Dodgson for a story and reluctantly at first he began to tell the first version of the story to them. There are many half-hidden references made to the five of them throughout the text of the book itself, which was published finally in 1865. 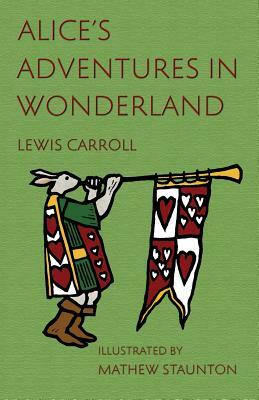 The text for this edition makes some alterations to Lewis Carroll's final revised text in order to correct some incon-sistencies which remained, or which appear to have been introduced, by Carroll in 1897. In the Evertype definitive text the aim has been to establish (or re-establish) clarity and consistency where it was lacking, while conserving the idio-syncrasies of Carroll's writing which have delighted readers for a century and a half. The playful and fresh illustrations in this volume were prepared by Mathew Staunton, on the basis of very personal mental images of Alice and the different characters she meets which developed when he first read the book many years ago, and were inspired in part by his daughter Aoife, who acted as model for the book.